NEW DELHI: Following his match-winning 7/48 in the final Test against England, Ravindra Jadeja has jumped to a career-best second spot in the latest ICC Test ranking for bowlers. Jadeja's match-haul of 10/154 has put him 8 points adrift R Ashwin, who continues to hold the top spot. 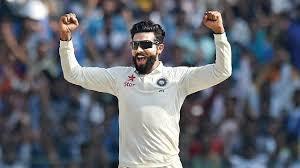 Jadeja has gained 66 points and has leapfrogged the likes Josh Hazlewood, James Anderson, Dale Steyn and Rangana Herath, which means this is the only occasion since 1974 that the top two spots in the ICC bowling chart have belonged to Indians - Bishan Bedi and BS Chandrasekhar being the last pair. Jadeja has also gained one place to reach a career-best third rank in the list of allrounders, which also is ruled by Ashwin. Apart from a tally of 43 wickets from nine matches this year, Jadeja has also contributed with the bat, scoring three half-centuries, two of which - a career-best 90 and 51 - came in the series against England. Ishant Sharma, who played the final Test was promoted by two places to hold the 23rd spot while triple-centurion Karun Nair has rose 122 places to be ranked 55th. His Karnataka team-mate KL Rahul, who scored 199 in the first innings, has also leaped 29 places to be placed at a career-best 51st. the final Test at Chennai has put him 8 points adrift R Ashwin, who continues to hold the top spot. 1 Response to "ICC rankings: Ravindra Jadeja jumps to career-best 2nd place, Ashwin retains top spot"